Several years ago, I encountered the Christian classic Ordering Your Private World. This book is one of the most transformative Christian self-help books I’ve ever encountered. It’s now available in an updated version, which is crucial for our current times. Author Gordon MacDonald eloquently speaks about the importance of crafting a quiet routine for spiritual development. In our fast-paced times, this is such a counter-cultural message that many will speed right past it. Yet it is one of the most vital messages we can receive today. The reason for its importance? Because God speaks in a still, small voice to us most often. God gives us individualized messages for our hearts during quiet times in His Word. He also speaks to us in those quiet times when everything else lulls—such as right before bed, when we awake due to insomnia, and even during our immersive chores. If we choose to listen, we will hear him speak love, peace, joy, and comfort to our hearts, as well as gentle correction. We cannot be truly close to God without cultivating quiet times in our schedules. God first sent a violent wind, then an earthquake, then a fire. The Bible says God was not in these natural disasters. But “after the fire came a gentle whisper.” (vs. 12) Elijah heard it and went out to speak with God, who gave him direction. God could have shouted to Elijah in the noisy wind. God could have boomed his truths to Elijah during the earthquake. God could have blazed a golden word for Elijah in the fire. But God chose to speak to Elijah in the gentle whisper. When did you last hear God’s gentle whisper to your heart? Is it possible that you’ve been too busy to hear it? Friend, I’m no different from you. I get over-involved in work, activity, responsibility, and entertainment. I sign up for too much and then complain about being too busy. Even my morning quiet time can sometimes feel like an item to check off a list. On Sunday night, I walked on the treadmill while reading Ordering Your Private World on my Kindle. I felt guilty about not spending time with my family, about not cooking the chicken that had languished in the refrigerator for days, about not prepping more for tomorrow. But I chose exercise and reading to the exclusion of everything else, and the only noise was the sound of my feet pounding the belt. That’s when I heard God’s gentle whisper. He corrected me, comforted me, and provided me new direction. God’s voice is so quiet, yet it holds more clarity, security, and peace than any other voice I hear. Are you willing to enter the private garden of your heart with God? Are you willing to set aside some time every day, just for the two of you? I encourage you to do so, friend. You are certain to find greater peace if you cultivate a quiet schedule that allows you to hear God’s gentle whisper. 1. How can you quiet your life to hear God's whisper this week? 2. How will your spiritual life benefit from hearing God's voice in your busy schedule? Reading this was like a giant sigh for me! I need to make time to be still and listen today... Thanks! Sarah, I like the idea of entering into a private garden with the Lord. And this, "God’s voice is so quiet, yet it holds more clarity, security, and peace than any other voice I hear." Amen! Wonderful post! 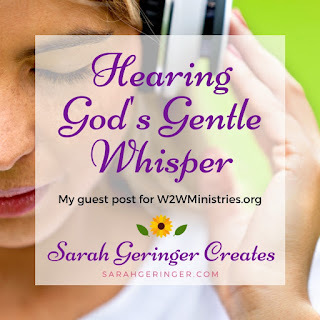 Sarah, this is one of my favorite passages as it confirms for me the very way God speaks to me - in His gentle whisper. The early morning hours, when it is yet dark and still are my most favorite time of day. When I first started waking early, it was a sacrifice and now, it is my delight, and are so worth it! Blessings! I've heard that MacDonald's book is a true treasure, Sarah. So I just now checked my Kindle library that I share with my hubby and see that he bought this (probably when it was on sale) and will begin to read it! I hope I find it as inspiring as it sounds you found it to be! Thanks for pointing us to the power of books! Pinning!